FREE ENTRY Saturday 2nd & Sunday 3rd of March; 12pm to 6.30pm on both days. We look forward to welcoming you to our 3rd edition of the Talented Art Fair, where there will be a bar, music, live painting, over 2000 original artworks & limited edition prints plus 100 Talented Artists. Since the Talented Art Fair burst onto the London's art scene in 2017 with a sold out crowd and display of 100 gallery level & award winning artists, it has fast become one of the most successful independent art fairs in London. The organisers Lemon Art, who are also the founders of the highly popular New Artist Fair, bring their team and knowledge and 8 year history of buyers with them to ensure this exciting new event continues to be a real success for both the art collectors and exhibiting artists. Talented 2019 brings a plethora of the most talented and sought after contemporary artists who are currently making serious waves in the art world today. Exhibiting artists include Sky Arts Landscape Artist of the Year 2017 Finalist John Ball, Art Gemini 2018 Overall Winner Lubna Speitan, re-exhibiting Professional artist Oliver Winconek who was featured on Sky Arts Portrait Artist of the Year 2017 and has exhibited at the Saatchi Gallery and Royal Academy, multiple award winning Photographic Artist Marcus Jake and a large variety of contemporary international talented artists. Each year one artist will be crowned Talented Artist of the Year based on a combination of their talent and success at the event. Previous winners are Talented Artist 2017 Vincent Kamp (Clarendon Fine Art, Mayfair) and Talented Artist 2018 Martin Turner (Art Salon, Bath), who will be exhibiting at Talented 2019. Another reason why Talented is so popular with art buyers and collectors, is that there is a ceiling price cap of £5,000 on individual artworks, although most originals for sale, range from approx. £300 to £1,500, making it not only one of the best art events to invest in, but also this show makes buying art both enjoyable and affordable. Following a highly successful launch in 2017, the Talented Art Fair returned to the Old Truman Brewery in the first weekend of March 2018. For its 2nd edition, the Talented Art Fair continued to showcase the work of some of today’s most exciting contemporary British and international artists, including painters, photographers, sculptors and printmakers. From emerging and award-winning talent, to recent graduates and established artists with years of experience, everyone who took part was carefully selected by the team. 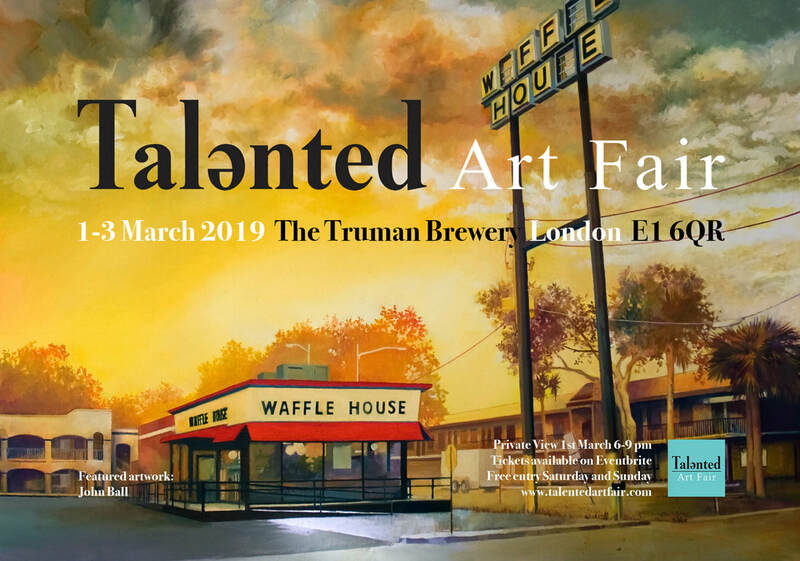 An art collectors' dream event, Talented Art Fair continues to exhibit artwork available by over 90 talented artists priced between £50 up to a maximum of £5,000 once a year at the Old Truman Brewery. We warmly welcomed over 8,000 visitors to the inaugural edition of Talented Art Fair! Brought to you by the team behind the New Artist Fair and taking place at London's iconic Old Truman Brewery, Talented Art Fair offers a new, friendly platform for discovering some of today's most exciting talented British and international artists, all well-established in their artistic fields. In a bid to make collecting and investing in art easier and more affordable, Talented Art Fair's team of select committee members carefully select the exhibiting artists, including painters, sculptors, print makers and ceramicists, all of whom have a track record of successful selling and whose work will be priced from £100-£4,000.